I'm not quite sure how single moms do it, every day of their life, but I have learned that weekends are hard by yourself. I know that not feeling well added to the particularly teary day, but just curious, have you ever had a day like this? Ever had those days? The ones you imagine on the weekend that will be laid back, carefree, where everyone rests, recharges, and just plays nicely? I had that dream today, before I was awoken before the sun. And before you judge me as a cold and heartless mom for literally counting each time her kids cry, let me preface this post with the fact that we've been sick. All of us, starting over three weeks ago. So naturally everyone is on edge, has cabin fever, is cranky and just plain wants to feel better. So on a glorious Saturday morning, when the sun was shining and the air was cool, I had a plan. We all could get our rooms in order, de-germify the house, play outside, and bake some muffins together. But unfortunately, the dream died quickly, because the crying game was in full force. With my hubby out of town, both girls were beyond miserable. After a few grumpy episodes before breakfast, I was in shock at how quickly the tears were flowing. So I decided to document each and every single time the girls cried, just to see how many times it happened. Here's an actual account of 30 reasons my kids cried today, in case you were wondering what hell sounds like. *Note if you're on the fence about whether to have kids, do NOT read below. 1. Awake to the sound of the cry followed by, "Mommy I'm pooping!" 2. Seven year old wakes up, comes in the room and cries because I won't get out of bed and turn on the TV. I convince her to lay down with me and try to go back to sleep. 3. Older girl cries because we ran out of Gorilla Munch cereal for breakfast. 4. Four-year-old cries because her big sister pushed her. 5. Both cry because the fort they built fell and fighting ensued. 6. Little one cried because I put the wrong flavor of yogurt in her smoothie. 7. Both cry over which cup holds their smoothies. Both inevitably want the same cup. 8.. Older girl cries because she has to pick up the toys scattered all over her room. 10. Older girl cries because she didn't get the pink plate. I throw out all plastic kids plates and declare it's time to use big girl plates. 11. Seven-year-old cries because I used the wrong hangars to hang up her clothes. 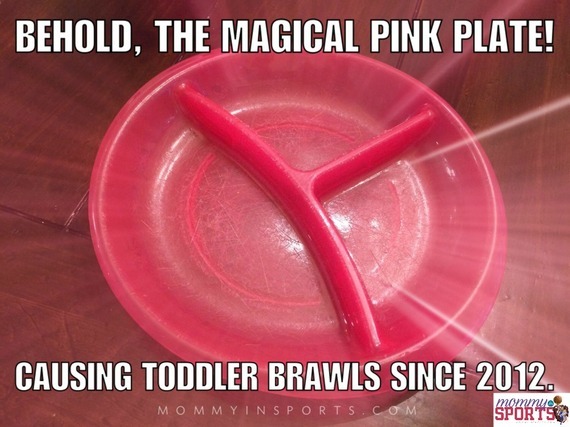 Then rips them off in a tantrum. 12. Cries some more because she now has to re-hang her clothes. 14. Four-year-old cries because her older sister won't let her use invisible ice powers. I explain they're INVISIBLE, so do whatever you want. 15. Older girl cries because she wants to be Elsa. 16. Let's make muffins, hooray for distractions! Seven-year-old cries because she wants to mash the bananas, not line the muffin tins. 17. Little one cries because her big sister won't let her lick the bowl. 18. 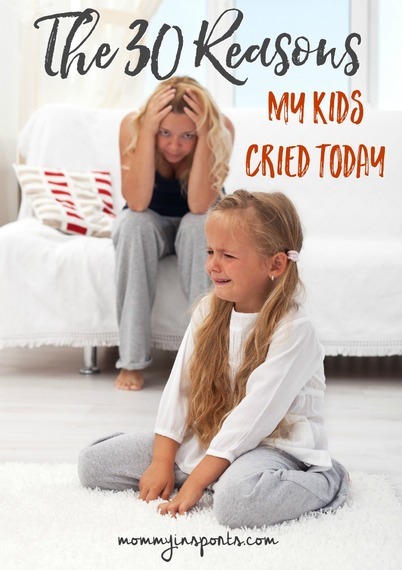 Older sister cries when sent to her room for not sharing the muffin batter bowl. 19. Makeover time! But wait, pre-tween cries because little sister is wearing too much lip gloss and 21. won't take it off. 20. Tired fournado cries because she doesn't want brinner for dinner. 21. 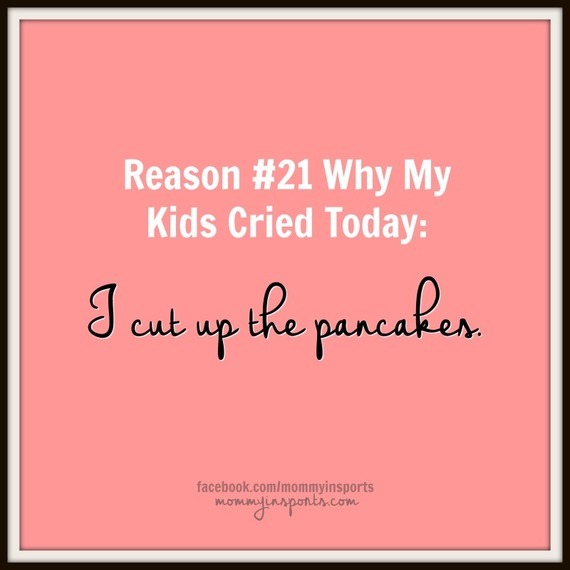 Then older sister cries because I cut up her pancakes. She wanted to do it herself, the horror! 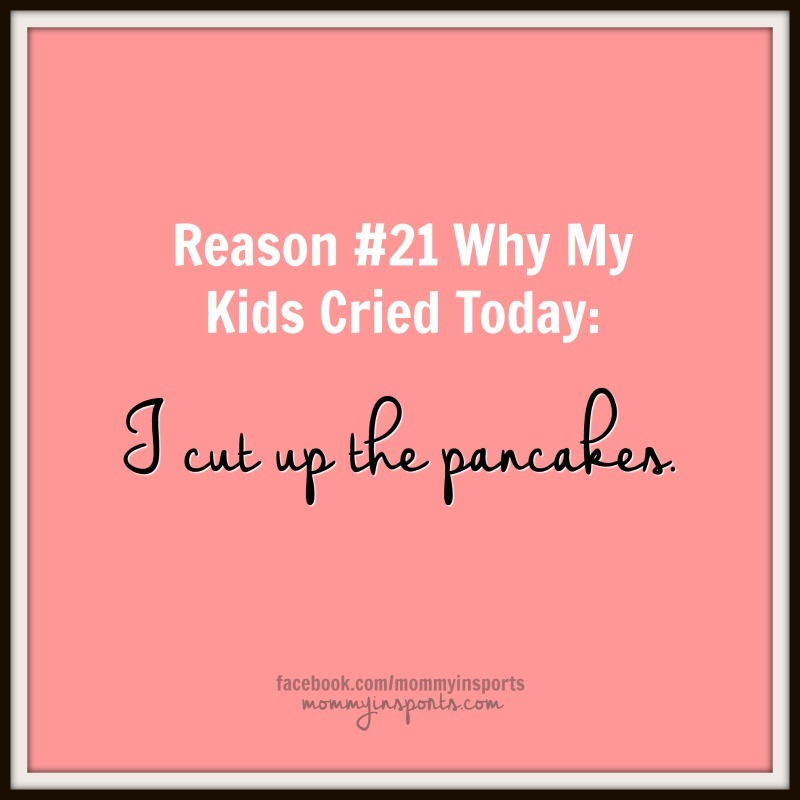 22.Little one cries because she can't have more syrup. 23. Both cry because they can't have dessert. I mean, they had pancakes for dinner, hello? THAT'S dessert! 24. Then both continue crying because they don't want to take showers and go to bed. 26. Then cries some more as I gently brush her hair. 27. Then cries because no one loves her. 28. Last cry of the night? Yeah right! Four-year-old cries because she can't watch TV, her evil mother is forcing her to read. 29. Then she cries because she wants milk...NOW. 30. Then she cries again when I trip over the kitten, fall on my hand, and can't get her milk RIGHT NOW. And that my friends is a not-so-fun Saturday solo with kids. I'm not quite sure how single moms do it, every day of their life, but I have learned that weekends are hard by yourself. I know that not feeling well added to the particularly teary day, but just curious, have you ever had a day like this? Kristen Hewitt is a two-time Emmy award winning television sports reporter and producer, and mom! This piece originally appeared on her blog mommy in SPORTS, and you can follow more of her chaotic misadventures of balancing sports broadcasting and motherhood on Facebook, Twitter, and Instagram. She's on Snapchat too, just hasn't figured out how to use it!